Last year, we got to spend a few days in Bartlesville celebrating Christmas with family. We had a great time quoting lines from Elf, opening presents, eating way too much, and getting schooled in Scrabble by my 10 year old niece. In other words, it was a perfect holiday. Since I grew up in Bartlesville, any trip back home brings back all kinds of memories – good and bad. In many ways, I have grown into a different person since I moved away from there 20 years ago. Some of those changes have been positive, some have been negative. A love of America. Putting on the stars and bars and taking on the world was an incredibly motivating idea. A love of Basketball. I thought I had the skills to compete. A love of Mary Lou Retton. Remember the 1984 games? As an 11 year old, I thought if I could just meet her, I had a chance . . . Anyway, by the time 1992 rolled around, I no longer lived in Bartlesville . . . and I no longer thought I could be an Olympian. Though the inclusion of the professionals did not help me (thanks a lot Dream Team), the reason I did not make it to the Olympics in 1992 was that I was not good enough to make the team. Time has an incredible ability to kill our dreams, doesn’t it? The longer we live, the more we are in tune with our own abilities and liabilities. The more basketball I played against better and better competition, the more I realized that I was not going to be the next Mark Price or even the next Tim Legler. My talent ceiling was 6A sports in Oklahoma. Getting a realistic picture of what I could accomplish caused me to alter my idealistic notion of being a Olympic champion. What about you? What did you used to think you were going to grow up to be? How has time changed your hopes and dreams? While it is fun and nostalgic to look back on our dreams of fame, it is tragic when we let the passing of time ebb away at the confidence we have in our spiritual lives. For far too many of us, we trust God with less with each passing year. This happens because over time we become more and more acquainted with our lack of ability to accomplish things we genuinely desire. Year after year, an illness remains, a relationship deteriorates, a sin struggle lingers, depression clings on. Because of the persistent nature of some of our struggles, and our lack of ability to change them, we begin to trust God with less. As we become aware of our liabilities, we begin to limit our expectations. When we limit our expectations, we shrink our dreams. When we shrink our dreams, we have a tendency to shrink our God as well. The flaw in all this is that we are attaching our hopes and dreams in the areas that matter most to us only to our own ability. As believers in Jesus Christ, we have a God we can trust for things way larger than that! Think about it: if you are a believer in Jesus, you are trusting God for forgiveness of all your sins. Your ability to be forgiven has nothing to do with your ability to accomplish something yourself, but it has to do with God’s ability to do more to you and through you than you could ever do alone! God forgives by sending His Son to die on the cross for us. That is how we are forgiven. However, as believers live out their spiritual lives, we can allow time to cause us to focus more on what we can do and less on what God can do. When we do that, our vision for tomorrow deflates. This year, this Christmas, I want to encourage you to inflate your vision again. Trust God more this coming year for things bigger than what you can accomplish on your own. I want to encourage you in this direction by looking at the first few words in Luke 2 tonight. At the beginning of the story of Jesus birth, Luke says this, “In those days a decree went out from Caesar Augustus. . .” If you have been a Christian for a long time (or if you have recently watched the “Charlie Brown Christmas” special), no doubt these words are very familiar to you. In fact, the name Caesar Augustus is one of the most famous names of any Caesar in the history of the Roman Empire. But who was Caesar Augustus and why do we know his name today? Answering that question is a very interesting story. In 63 BC, a young man named Gaius Octavius was born. Octavius was in the Roman army. At that time, a man named Julius Caesar was the dictator of Rome. Julius noticed the great skill and leadership ability that Octavius had. Octavius was Julius’s nephew. Julius had no children of his own. Unknown to Octavius, Julius had written into his will to adopt Octavius upon his death, and make him the heir to his fortune and political successor. On the Ides of March, in 44 BC, Julius Caesar was assassinated by political adversaries in the Roman Senate. Octavius was summoned to Rome to hear a reading of his late Uncle’s will. In the will, Octavius found out his future would be changed forever. He had been post-humously adopted by his uncle Julius and at the age of 19, Octavius had become the leader of Rome. As a tribute, Octavius took on Julius’s name “Caesar,” making him Octavius Caesar. In 42 BC, the Roman Senate deified Julius Caesar, making him the “Divine Julius” and Octavius, “The Son of the Divine” or as we might say, he became known as the “Son of God.” Then, in a twist that changed the course of Rome, Octavius changed the Roman constitution making himself an Emperor and Rome an Empire. At that time, they changed his name to Augustus . . . which means “Sacred one” . . . Thus Augustus Caesar became known as the Sacred One, the Son of God. 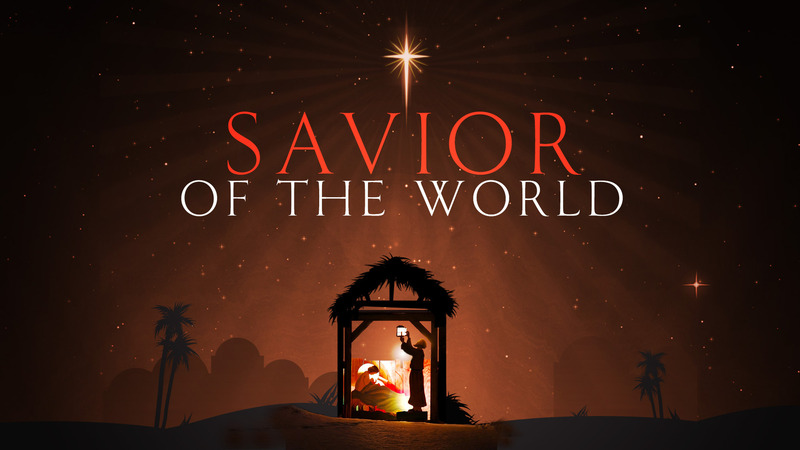 He was the leader of the world at the time of Jesus birth. Caesar Augustus was such a powerful man that he was able to speak a word and make the entire Roman Empire move. When you are an emperor and people think you are a god, you have lots of power. That is why when Caesar developed a new tax code and said that people needed to go to their ancestral homes to register, people started walking – among them Mary and Joseph. Now imagine that you were alive in the Roman Empire on the night that Jesus was born, and imagine that you were walking with a set of travelers to the town of Bethlehem to register for the census. Imagine that someone were to say to you that alive in the world at that time was one known as the Son of God, the Sacred one, who would be known for 2,000 years and counting into the future. Imagine that someone were to tell you on the way to Bethlehem that 2,000 years later all of human history would hinge around this Son of God and what He would accomplish with His life. Imagine that someone were to tell you that 2,000 years later, people would look at pictures and symbols of this Sacred One and think of how the Son of God had changed their lives. Imagine that. I would imagine that if someone would have told you all that on that night, you would have thought they were talking about Caesar Augustus. In reality, however, they were talking about a child that would be born later that night in a cave and placed in an animals feeding bin. This Christmas, as you ponder anew what the Almighty can do, I want you to stop limiting what God can do. I want you to renew your belief that God can do big things. As the Christmas story is read and you hear of Caesar Augustus, I want you to remember the power of God. Caesar thought he was a god and tried to make himself famous, but in the end, he was a footnote in history. Time has taught us of the limitations of human power. However, time has also taught us of the enduring nature of God’s story. When we are attached to Christ, He can do infinitely abundantly beyond all we ask or think. I want you to trust God again for big things this year, because we serve a big God. Now, I want to ask you this question. Who are you trusting tonight? For the problem of our sin. For the problem of our uncertainty. For the problem of our mortality. For the things you truly long for. Who are you trusting? Yourself? The best a person could do is what Augustus did . . . and he is rotting in a tomb. Trust instead in the One who has gone from the manger to a throne that will never be unseated. He can offer us forgiveness, and hope. He is the One we orient our history around. His story gives meaning to ours. My dreams are bigger because I am a part of His team. This devotional is part of a 25 day devotional guide. Download all 25 days of the devotional in pdf or ebook format (for free) by clicking here.